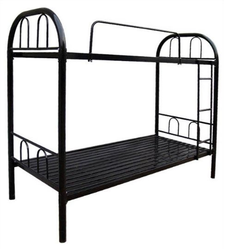 STEEL DOUBLE BUNK BED - MS SIZE: 12' L x 3' W x 5' H LEGS: Fabricated with 11/4" square for legs with 1" & 3/4 18 Gauge square MS steel Pipe for cross supports, Ladder are fabricated by 1" 18 Gauge square MS steel Pipe. BED: Fabricated with 2" x 1" 18 Gauge rectangular 1" 18 Gauge square MS steel Pipe for cross Supports. fully painted finished. Providing 12mm thick hardwood ply bed panel. Based on colour and quantity of the bunk bed. if the bed is customized it will tack two to three days extra. 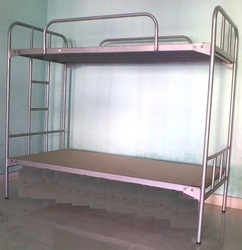 fixed bunk bed means given the mentioned period. SIZE: 6'L x 3'W LEGS: Fabricated with 11/4" 18 Gauge round MS steel Pipe with 1" & 3/4" Round for Ladder and Support Pipes duly welded and painted.BED: Fabricated with 18 Gauge CR sheet with three Strips under the bed.